Upon arrival in Langkawi, proceed to check in to the hotel. If you arrives in the early morning, you may want to find a place for breakfast, Pantai Cenang, Pantai Tengah and Kuah town have plenty of choices to get your stomach filled. After breakfast, back to the hotel for a short rest or take a stroll at the restaurant area to find out more about Langkawi. In the afternoon, join the mangrove tour on boat to explore caves, limestone formation and grab the chance to see the plethora of tropical floras and faunas. 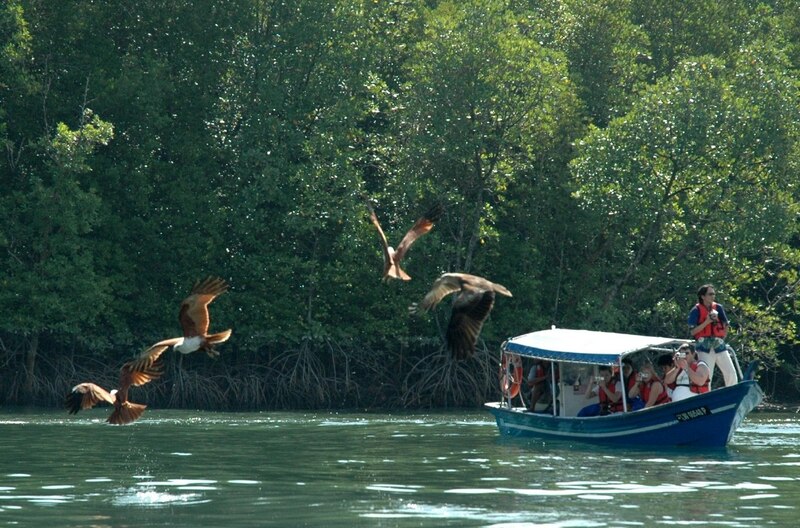 One of the highlights of this mangrove tour in Langkawi is the eagle area where visitors will get to see plenty of eagles flying all over the sky. The tour will takes about 4-5 hours. At night, visit one of the seafood restaurants in Kuah town or Cenang for dinner. After breakfast in the hotel, proceed to collect your pre booked rental car. You may want to ask the car rental provider to send the car directly to your hotel or any nearby places to avoid any unnecessary transportation charges for collecting the car. In the morning, visit Mount Matchinchang for an exciting cable car riding to the peak. From the summit, you can expect to see the beautiful view of the Langkawi Island and enjoy the pleasant whether in the morning at the hill top. Oriental Village is just located at the foothill of Mount Matchinchang where you can have a round of souvenir shopping, be pampered with spa and be refreshed with some light refreshment after the cable car riding. By now, it should be in the noon time, proceed to the nearby Pantai Cenang (Cenang beach) for lunch. After lunch, visit the popular Cenang beach for some exciting water activities. If water activity is not something you like, perhaps, take a stroll by the beach or take a sit under the casuarina trees to enjoy the laid back beach atmosphere could be a good alternative. After the beach visit, proceed to the nearby Underwater World, the largest marine and fresh water aquarium in South East Asia. A good place to get close with the marine life without having to get wet. Spend at least 1 hour in the aquarium before heading to Eagle Square in Kuah Town. After a short photographing stop at Eagle Square, find a restaurant in Kuah Town to enjoy your dinner. As this is a short 3 days visit in Langkawi, it is recommended to leave this beautiful island in late afternoon or evening. In the morning, join a island hopping tour to visit the popular Dayang Bunting Island, Singa Besar Island and Beras Basah Island. Each island has their unique features and be sure to find out from the guide during the tour. Island hopping tour in Langkawi will normally takes 3-4 hours. After the tour, you should proceed to Kuah Town for lunch and duty free shopping. In the late afternoon, proceed to Kuah jetty to catch the last ferry back to the mainland or catch your flight in the Langkawi International Airport to continue your journey or back home. A stone throw away from the Langkawi Airport. Value for money accommodation and easy access to the Cenang Beach.